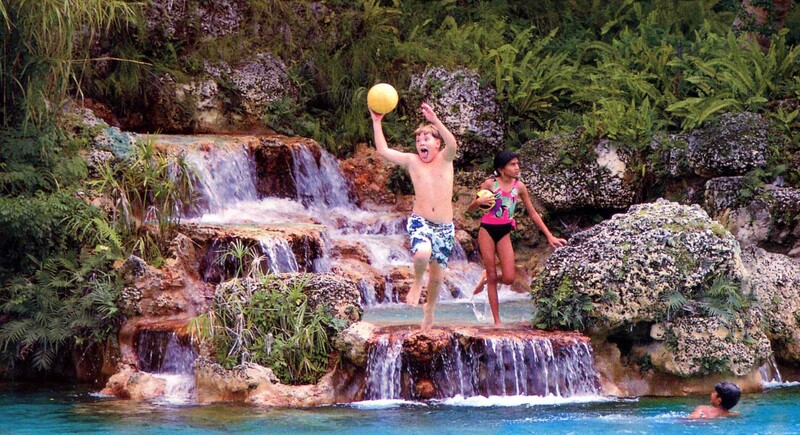 Children enjoying the Venetian Pool, a former limestone quarry that was transformed to resemble a Venetian lagoon in the 1920s. Located just south of Miami, Coral Gables, Florida (population 42,249), was the brainchild of real estate developer George Merrick, who launched the community in the early 1920s. The community was based on the best city planning principles of the time, incorporating wide tree-lined avenues, monumental buildings, winding roadways, green space, and ornate plazas and fountains. Buildings showcased the Spanish and Mediterranean Revival style. Notable examples include the Biltmore Hotel, a National Historic Landmark, and the Venetian Pool, a quarry that was transformed to resemble a Venetian lagoon. While the Mediterranean esthetic was paramount in the city's design, Merrick also created seven eclectic "villages" scattered through the city, including a French Normandy Village, a Chinese Village, and a Dutch South African Village. Today, Coral Gables retains much of its original character, and is known as "The City Beautiful." The city recognized early the importance of protecting its historic resources and passed a historic preservation ordinance in 1973. Currently, more than 200 properties are listed on the local historic register. The city's past will be celebrated in the new Coral Gables Museum, which is being developed in the city-owned Old Police and Fire Station (1939). To promote the museum and the community's other historic attractions, the city has partnered with other regional municipalities and the Greater Miami Convention and Visitors Bureau to create a Heritage Task Force. In 2004, the task force published Miami: A Sense of Place, an illustrated directory to the area's major historic assets. Designated a Preserve America Community in Novembre 2004.